Shrimp is always on my appetizer list during the busy holiday season, along with the Hot Fajita Wings with Guacamole and the Spinach Stufffed Mushrooms. These three simple appetizers compliment each other and will satisfy your guests while the dinner is prepared or as an additional to your cocktail party. Finding appetizers that can be prepared ahead of time is the key to a successful party. The marinade is the perfect balance with the crisp green snow peas. You may substitute the snow peas if you are unable to find them with a crisp slice of cabbage, red pepper,or jicama. (no onion) Prepare the shrimp and marinate the night before and place in a zip lock bag, then refrigerate. Attach the snow pea to the shrimp with a toothpick at the last moment before serving . Can be served cold or at room temperature. Add bay leaf to a large pot of water and bring to a boil. Add the shrimp and cook, stirring constantly, until just done. (2-3 minutes). Drain shrimp and place in a bowl or large plastic bag. Mix vinaigrette ingredients in a covered jar. Shake well and pour over shrimp. String the peas and blanch in boiling water for 30 seconds. Drain and cool. 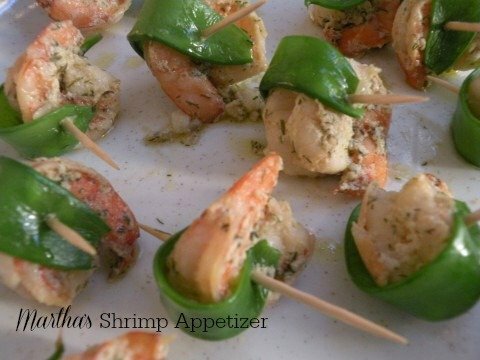 Wrap a pea around each shrimp and secure with a toothpick. The vinaigrette can be made a couple of days ahead. The shrimp can be cooked the day before and marinated. Assemble the day of the event. Enjoy more Appetizer recipes on my blog. This recipe came from the first Martha Stewart Entertaining Book. Thanks for taking the time to visit. I also do enjoy seein gother Greek sites, so I added you to my listing. I enjoyed reading about your Beef manestra, one of my favorites! !